On January 6th of this year WPSCF hosted the men and women from West Point's swim team. There were 68 cadets and coaches that we hosted and it was a great opportunity to talk with cadets and just meet some great young leaders. After the lunch, a number of the staff from the restaurant came up to talk to me. The comments the staff made to me left an impression. All the staff kept bringing up was about the men and women they had just met and what a great group of young people they were. They couldn't believe how polite and patient everyone was. Their experiences with large groups is not always good. The swim team were great ambassadors for West Point and made us all extremely proud. We were able to host these fine men and women because of your contributions to our society and I would like to thank all of you that have contributed this year and ask those of you who have not had a chance yet to think about supporting our activities. Last year we did not officially do a membership drive but we are doing one this year. I wanted you all to know what your contributions allow us to do. First and foremast we support local recruitment activities, driven by Mike Ulekowski ('75). 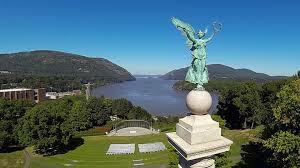 We have been very successful for a number of years getting some of the best applicants to first consider going to West Point and then many accept appointments to USMA. Your contributions help fund that activity. We also use the funds to support cadet activities in our local area like the Swim Team visit and also the upcoming USMA Tennis Team match against Air Force. If you haven't yet checked out the Tennis Team Event set for this weekend, please check our website for more information. It is going to be a great event. Once again, your contributions help support their activity here. We also have some other events that are "self funded" but in the case of Founders Day, our biggest event, your support helps us defray the cost for cadets, applicants and their parents. We truly could not provide the type of support required without your contributions. Many of you may be busy and have not "yet" been able to attend any of our events but your support of our mission is still important. Thank you once again for all those that have contributed this year and for those who have been thinking about joining/contributing, please give it serious consideration. The last thing I'll say is that we hope to see you all at Founders Day on Friday, March 22nd. Is it too early to say "Beat Navy"? If you want an easy way to get to our website and you have an iPhone or iPad then watch this video. This video shows you how to add the WPSCF website icon to your mobile device. This is a short video under two minutes long showing the steps needed to add this icon to your iPhone or iPad. Once we find an Android device we can use, we will also do a video for that. The U.S. Military Academy at West Point is pulling away from the Defense Department's email system, a move that could show the U.S. Army how to communicate differently in the future. Beginning this month, West Point will break free from the Pentagon-controlled .mil network and move to a commercially managed .edu network as part of a larger effort to upgrade its website, email and cyber presence, according to a West Point press release posted by the Defense Visual Information Service.